Years ago, orthodontic treatments were used only for pre-teens and teens having problems with their bite (malocclusion) and usually meant extensive travel for those living in the Miramichi area. Today, orthodontic treatments like dental braces are not only for pre-teens and teens, but for adults as well and less travel is involved if you are a patient at Quali-Dent. Quali-Dent now has two Orthodontists who do regular on-site visits decreasing significantly the amount of necessary travel for its patients. The position of your teeth and jaws has an effect on your bite and your bite is determined on how your top and bottom teeth come together. When your top and bottom teeth do not fit together properly, this is called a malocclusion or a bad bite. Problems like missing, crooked, crowded, protruding teeth or thumb or finger sucking (toddlers) can contribute to a bad or abnormal bite. Different types of bad bites include an overbite, a cross-bite; an over-jet and an open bite which all may make it more difficult to chew certain foods or may cause your teeth to wear down. It can also cause muscle tension and pain. Teeth that stick out are more easily chipped or broken. Crowded and crooked teeth are harder to clean and may be more likely to get cavities and gum disease. Fixing a bad bite does not only improve your smile but also improves your oral health. The most common type of orthodontic treatment used by orthodontists is braces. Today’s braces are smaller and less noticeable. Besides the traditional metal braces, there are tooth-colored ceramic braces that are less noticeable. Clear aligners are also available for adults. Braces and elastics can also be multicolored. Speak to our professionals at Quali-Dent to discuss your choices and to find out more how we can make the transformation of your smile more easily attained, offering; less travel and top notched accredited on-the-spot orthodontist treatments. Orthodontic treatment takes time. The amount of time depends on your age, the seriousness of your problem and the treatment technique used. Treatment generally involves visits to your dentist and your orthodontist on a regular basis over a period of months to years. In general, it takes longer to treat adults than children or teenagers. 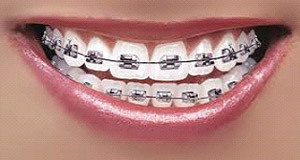 Most people wear braces for approximately 2 years.